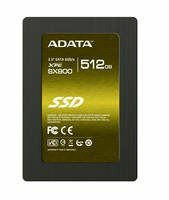 ADATA™ Technology, a leading manufacturer of high-performance DRAM modules and NAND Flash storage application products, announces the availability of the XPG SX900 Solid State Drive for the USA & Canada. With up to 512GB of storage potential, the biggest model of this SSD line has a 7% capacity increase over common SSDs in the market that use a SandForce controller. The XPG (Xtreme Performance Gear) family of products has been expanded to include solid state drives, and the SX900 is a perfect match for the performance requirements of this elite group. Built for enthusiasts, the SX900 utilizes a SATA III 6Gbps connection and SandForce 2281 controller. Its maximum sequential read and write speeds are 550/530 MB per second, with maximum random 4k write speeds as high as 85,000 IOPS. The XPG SX900 SSD adopts specially selected flash chips and supports the Windows TRIM command for efficient allocation of unused space. This results in more accelerated transfer and write performance for the XPG SX900, and is also effective in slowing down efficiency decline and depletion chances, maintaining effective operation and extending the life of the disk. In both desktop and notebook computers, users will enjoy an unprecedented high-speed experience when they edit videos, retouch pictures, and use computer drafting, reading and writing operations. Other than the groundbreaking 512GB model, the XPG SX900 SSD is also available in 64, 128, and 256GB capacities.